Keeping up with technology can be a daunting task for tech leaders. Each year, to make the task a little easier, we analyze behavior on the O’Reilly online learning platform, using the platform as a massive sensor that yields insights and identifies areas tech leaders should pay attention to, explore, and learn. Our analysis includes the top search terms and the topics that garner the most usage on our learning platform. This combination of search and usage data provides a holistic view; search data shows the areas where subscribers are exploring, and usage identifies topics where they’re actively engaged. Interest in blockchain, which we first noted in 2017, continues. While the full potential of the blockchain gets sorted out, consider that if you’re not investigating blockchain, someone you compete with is. The growth we’ve seen on our online learning platform in cloud topics, in orchestration and container-related terms such as Kubernetes and Docker, and in microservices is part of a larger trend in how organizations plan, code, test, and deploy applications that we call the Next Architecture. This architecture allows fast, flexible deployment, feature flexibility, efficient use of programmer resources, and rapid adapting, including scaling, to unpredictable resource requirements. These are all goals businesses feel increasingly pressured to achieve to keep up with nimble competitors. There are four aspects of the Next Architecture, each of which shows up in the platform’s search and usage data. Organizations get a lot of benefits by breaking large and complex activities into small, loosely connected pieces. Through decomposition, these activities can be turned into standalone services that can be developed independently and linked together to create a more complex application. Microservices, the manifestation of decomposition, was the number 13 search term on our online learning platform in 2018. An organization needs the flexibility to adjust, scale, and innovate its digital presence—often across different time zones and geographies. The cloud supports these goals with compute instances that are fungible, coming and going as needed, and easy to replace automatically if failures are detected. The move toward decomposition (microservices) helps accelerate the trend toward the cloud by providing more impetus for quickly spinning up and managing services that support the need for dynamic, adaptable applications. Cloud-related terms had a significant presence in the search and usage data. AWS, Amazon’s suite of cloud-based tools, was the number 4 search term, and it had 28% growth in year-over-year usage. 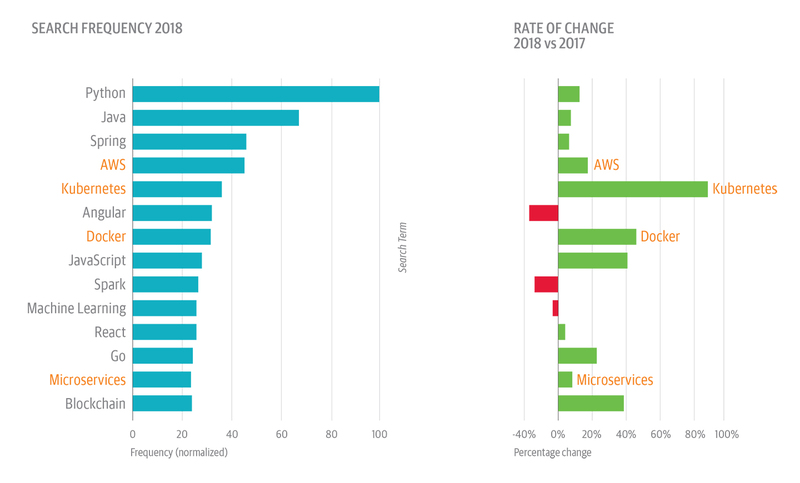 Google Cloud (66% growth in usage over 2017) and Microsoft Azure (60% growth in usage) also increased. In addition, the topic “cloud migration” was up 40% in usage in 2018. Containers provide a lightweight way to achieve the modularity favored by decomposition and the cloud. Docker, the number 7 search term in 2018, makes it easy to automate the deployment of the microservices that are created through decomposition. The huge number of microservices running on containers—often in the hundreds or thousands—exceeds the capacity of humans to track and manage them. Orchestration tools, notably Kubernetes, fill the gap through rigorous specifications and automation. Kubernetes was the number 5 search term in 2018, jumping 11 spots, and usage growth was up a notable 160% year over year. We’ll continue to explore the Next Architecture in the coming months. 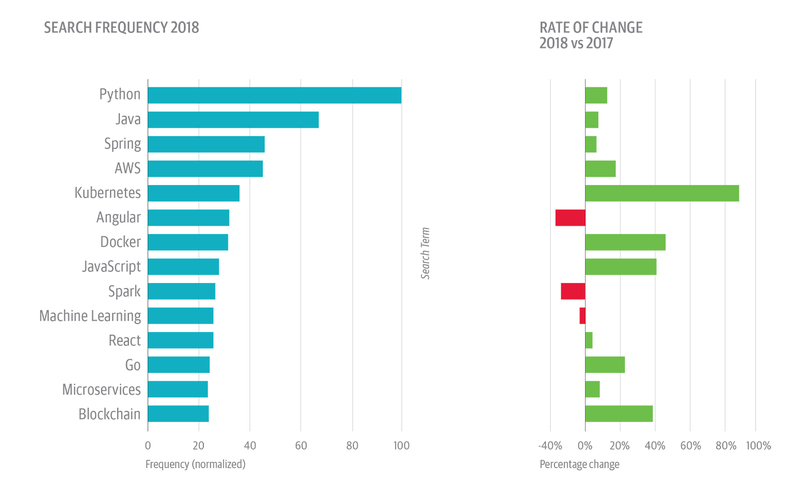 Blockchain, which was one of the stars in our 2017 results, jumped seven spots in the top search terms (number 13), and it was up 36% in usage in 2018. Ethereum, a tool for implementing blockchains, was up 66% in year-over-year usage from a small base. Platform subscribers were likely exploring blockchain to assess its potential, developing an awareness of where blockchain may fit into their strategic plans or evaluating it as an existential threat, mostly in the areas of payments, supply chain logistics, and provenance. Python gets a boost, in part, from the increased interest in machine learning (ML). Many ML libraries, such as TensorFlow, are wrapped in Python libraries and promoted with Python interfaces. Ascendant ML tools also bolster interest in Python. For example, PyTorch, a library for computer vision and natural language processing, saw a 300% increase in year-over-year usage from a small base, and scikit-learn, another Python-based machine learning library, was up 39% in usage. Many tools used in big data applications—notably the ones from the Apache Foundation, such as Spark and Kafka—feature Java interfaces. Thus, machine learning and big data may explain the popularity of both Python and Java. Java also remains a workhorse language for large-scale applications. Finally, the fastest usage growth we saw for any language between 2017 and 2018 was for Rust (up 44%). Rust is a systems language with near-C performance, safe, efficient memory management, native concurrency support, and a modern syntax. 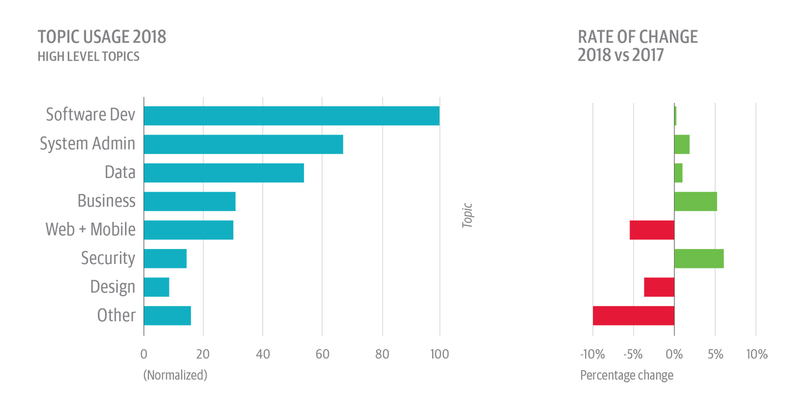 Developers are increasingly finding Rust a good fit when performance is or becomes a priority. There are a few more items from the analysis that are worth calling out. Machine learning (ML), the number 10 search term, has been a leader on our learning platform for more than a year, as we showed in last year's trends. In 2018 we saw a change in the distribution of interest in ML topics within the search and usage results. There was less growth in exploratory topics and phrases like “machine learning” and “deep learning.” This was coupled with a shift toward more specific topics like “natural language processing” (up 22% in search and 11% in usage) and “reinforcement learning” (up 122% in search and 331% in usage from a small base). We attribute the shift to the maturation of the ML topic and a move beyond exploration toward more engaged implementation. This is a trend reinforced by the ML and artificial intelligence surveys we’ve run. A 5% increase in usage for business-related material on the platform highlights the importance of tech for every facet of a business. It also aligns with the idea that all companies are now tech companies. Security content went up 6% in usage in 2018, which is a good sign since we’ve noted in the past that security was underappreciated. Increased scrutiny from notable breaches may partly explain the increase. The development of distributed systems also presents new security challenges organizations must confront. The rise of the Next Architecture, the maturation of blockchain, and emerging patterns in programming languages are areas of focus for us in the year ahead. We’ll continue to examine search and usage data on the platform, and we’ll also engage in research via conversations with our conference speakers and attendees, through perspectives from our community of practitioners and thought leaders, from media coverage, and from other sources. Ultimately, we want to see if these additional signals reinforce or challenge the findings from our platform data. This article is based on non-personally-identifiable information about the top search terms and topics on the O’Reilly online learning platform in 2018. Article image: Radar dish at dusk (source: michaelqiao13591 via Pixabay).